Jerry has more than 27 years of marketing, management and administrative experience. This experience include: contracts and procurement, governmental banking and finance, budgeting, pensions and investments, personnel administration, and project management. Thus, Mr. Gray has successfully planned and managed a wide spectrum of diverse projects. Jerry Gray was affiliated with Chitwood & Harley, Law Firm as Director of Government Relations, to assist with Local and State Pension Funds, as of June 01, 2003. On January 12, 1999, Governor Roy E. Barnes of Georgia appointed Gray to the newly created position of Deputy Chief of Staff. Gray’s first assignment was to develop a work plan that approached government in an innovative and entrepreneurial manner so the programs and activities at the agency level support the Governor’s agenda, policies and programs. As Deputy Chief of Staff, Mr. Gray was responsible for the day-to-day operations of the Governor’s Office of External Affairs. This includes Business Development, Community Relations and Intergovernmental Affairs. He served as the Governor’s liaison to nineteen (19) agencies/departments, which had a combined annual budget of more than $1 billion, and over 4,000 employees. In addition, Mr. Gray had to oversee a pension and investment budget of over $60 billion and a capital improvement/construction projects budget of $500-$750 million. Mr. Gray is a veteran of public service. In 1990, he joined Fulton County. There he served as the Chief of Staff for Commissioner Martin L. King. III for 4 years where he was instrumental in the program design of the County’s Office of Contract Compliance. 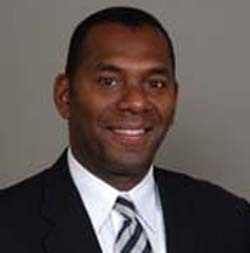 During his absence from government, Gray was Director of Market Development for Thermo Information Solutions, a technology-based firm. In this capacity, Gray had the overall marketing responsibility for local, state, and federal governments and the private sector. He also worked with Maxwell Laboratories, a defense contractor, as part of their strategic business development team. As President of J.G. Consultants, Inc., formerly Gray & Associates, Gray provided advisory services as a Consultant to governments and organizations. In 1997 and 1998, Mr. Gray served as a key advisor to then-State Representatives Roy E. Barnes in his gubernatorial campaign. Prior to his appointment as Chief of Staff, Mr. Gray served on numerous local, state, and national professional organizations of many civic, business and religious organizations. A native of Arkansas, Gray attended the University of Central Arkansas, Philander Smith College and received his B.S. degree at Morris Brown College. Jerry is married to Joyce, his wife of 34 years who is a former Human Resources Manager of Argonaut Insurance Company. They have two children, Jessica J. and Andrew L.